The ReadingPen TS from Wizcom Technologies is a personal reading assistant that can improve reading skills dramatically aimed principally at people with reading difficulties, dyslexia or learning disabilities. Featuring the Oxford English Dictionary and Roget's II Thesaurus, it provides a simple and easy way to get immediate word support when you are reading. The text scanner is a portable, hand-held personal reading assistant with an easy-to-use touch screen and icon-based menu. The ReadingPen TS provides immediate word support to readers of all ages. It also includes audio pronunciation (in English) of the scanned or typed words. The ReadingPen TS is an ideal tool for anyone in need of comprehensive English language support and is especially helpful to students who have reading difficulties. 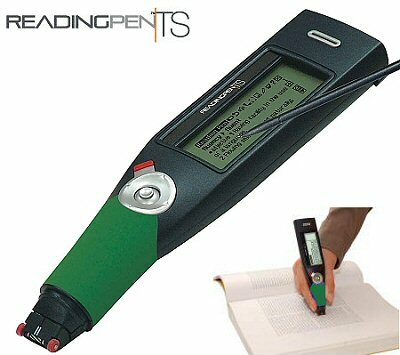 The ReadingPen TS contains both the Basic and Advanced dictionaries, so this one pen covers all reading levels. Enhancements include playback of entire paragraphs, educational word games, touchscreen, virtual keyboard, and USB connection to PC. This reading assistive pen helps students improve their comprehension, vocabulary, and language fluency. Suitable adults and children over 10 years old. The Readingpen®TS is the newest portable, hand-held “Personal Reading Assistant” with a NEW, easy to use touch screen and icon-based menu. The Readingpen®TS provides immediate word support to readers of all ages. It also includes audio pronunciation, (in English) of the scanned or typed words. The Readingpen®TS is an ideal tool for anyone in need of comprehensive English language support. It is especially helpful to students who have reading difficulties. Includes fun word games for English vocabulary practice and enhancement. The ReadingPen TS is an ideal tool for students, researchers and business people who need to scan data even when they are away from their computers. The fully portable ReadingPen TS is equipped to store large amounts of scanned text which can be transferred to the computer when convenient. It can also be used to scan text directly into any Windows-based application. Is it hard to use? If you have good dexterity, it's easy to use. Here's a simple test. If you can highlight a line of text in a newspaper using a highlighter pen, you will be able to use the pen. If not, this pen will not be suitable for you. Does it really read to you? After you complete scanning a line or word, the pen recognizes the characters and looks up the words in its internal dictionary. It then can pronounce them in sequence. How accurate is it? Generally 97% accurate - scanning accuracy generally increases with practice. Can I only scan text in? No, you can also input words using the pen's own touchscreen keyboard, so you can also hear pronunciations & definitions of words you see that are not on a printed page.